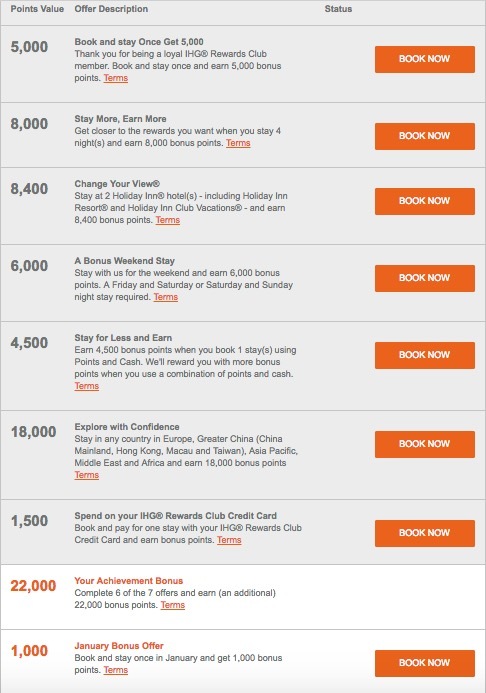 IHG has been offering their Rewards Club Accelerate bonus points promotion with regularity, and they have just announced their bonuses for the Q1 of 2017. The promotion runs from January 1st, 2017 – April 15, 2017. Much like their most recent promotions, each member of IHG Rewards Club will have their own unique offer. You must register ahead of time, which is good to do as soon as possible so you can see what your unique goals are. Earn 74,400 total bonus points. Complete all of your Accelerate offers and earn 74,400 total bonus points. Thank you for being a loyal IHG® Rewards Club member. Book and stay once and earn 5,000 bonus points. Get closer to the rewards you want when you stay 4 night(s) and earn 8,000 bonus points. Stay at 2 Holiday Inn® hotel(s) – including Holiday Inn Resort® and Holiday Inn Club Vacations® – and earn 8,400 bonus points. Stay with us for the weekend and earn 6,000 bonus points. A Friday and Saturday or Saturday and Sunday night stay required. Earn 4,500 bonus points when you book 1 stay(s) using Points and Cash. We’ll reward you with more bonus points when you use a combination of points and cash. Book and pay for one stay with your IHG® Rewards Club Credit Card and earn bonus points. Complete 6 of the 7 offers and earn (an additional) 22,000 bonus points. Book and stay once in January and get 1,000 bonus points. This is an intriguing offer, especially since I have an upcoming trip to Europe. While I have already booked my hotels for that trip, the fact that I can get 18,000 points for a one night stay in Europe, plus 5,000 points for making a stay, plus 1,500 if I put it on my IHG Rewards Club Credit Card, plus 1,000 for one January stay, plus whatever regular points I earn for the stay & spend itself, means that if I can find a convenient, cheap (or even a reasonably priced) room for one night during my trip, it would be worth it to make a mattress run, considering those points would be worth around $150. Be sure to sign up to see your Q1 2017 Accelerate promotion, since you might find a pleasant surprise as well. Even if you don’t have any plans for upcoming stays, you might find that your offer is similar to mine, and you can get a nice amount of points for cheap. What offer did you receive for your IHG Accelerate promotion?